French nuclear energy giant Areva has jumped into the U.S. renewable energy market with the acquisition of Ausra, a Silicon Valley solar power plant startup backed by high-profile venture capitalists. Terms of the deal were not disclosed, but in an interview on Monday, Areva executive Anil Srivastava said that the price the company paid for Ausra was in line with the $418 million that rival Siemens spent last year to acquire Solel, an Israel solar power plant builder. That would be a decent payday for Ausra’s investors, which include marquee Silicon Valley venture capital firms Kleiner Perkins Caufield & Byers and Khosla Ventures. “The current shareholders are very well-reputed venture capitalists and I can assure you they negotiated very well,” said Srivastava, the chief executive of Areva’s renewable energy division. SunPower, a leading Silicon Valley solar company, said on Thursday that it has agreed to acquire SunRay Renewable Energy, a European photovoltaic power plant builder, in a $277 million deal. The acquisition follows Monday’s purchase of Ausra, another Silicon Valley solar technology company, by Areva, the French nuclear energy giant in a deal that an Areva executive valued at around $400 million. SunPower has previously supplied solar panels to SunRay, which has a pipeline of projects in Europe and Israel that totals 1,200 megawatts. SunRay, which is headquartered in Malta, is owned by its management and Denham Capital. You can read the rest of that story here. Ausra is continuing its exit from the business of building solar power plants, announcing on Wednesday that it has sold a planned California solar farm to First Solar. The Carrizo Energy Solar Farm was one of the three large solar power plants planned within a few miles of each other in San Luis Obispo County on California’s central coast. Together they would supply nearly 1,000 megawatts of electricity to the utility Pacific Gas and Electric. First Solar will not build the Carrizo project, and the deal has resulted in the cancellation of Ausra’s contract to provide 177 megawatts to P.G.&E. — a setback in the utility’s efforts to meet state-mandated renewable energy targets. But it could speed up approval of the two other solar projects, which have been bogged down in disputes over their impact on wildlife, and face resistance from residents concerned about the concentration of so many big solar farms in a rural region. First Solar is only buying an option on the farmland where the Ausra project was to be built, according to Alan Bernheimer, a First Solar spokesman. Terms of the sale were not disclosed. The deal will let First Solar revamp its own solar farm, a nearby 550-megawatt project called Topaz that will feature thousands of photovoltaic panels arrayed on miles of ranchland. “This will allow us to reconfigure Topaz in a way that lessens its impact and creates wildlife corridors,” said Mr. Bernheimer. When it comes to renewable energy, Texas has been all about Big Wind. But this week the Lone Star State took on its first Big Solar project when San Antonio utility CPS Energy signed a 27-megawatt deal with Tessera Solar. 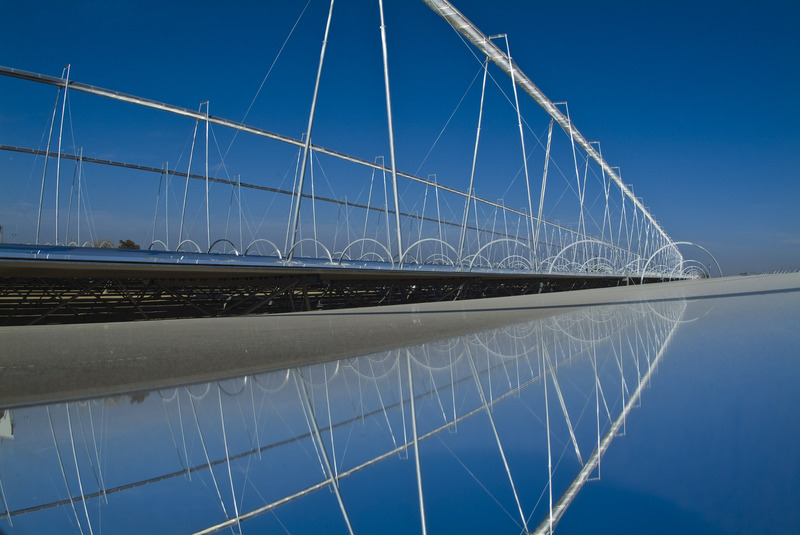 Houston-based Tessera is the solar farm developer for Stirling Energy Systems, which makes a Stirling solar dish. Resembling a giant mirrored satellite receiver, the 25-kilowatt solar dish focuses the sun’s rays on a Stirling engine, heating hydrogen gas to drive pistons that generate electricity. (Last year Irish green energy firm NTR pumped $100 million into Scottsdale, Ariz.-based Stirling Energy Systems and created Tessera to develop solar power plants using the Stirling dish, called the SunCatcher. Stirling Energy Systems previously signed deals with Southern California Edison (EIX) and San Diego Gas & Electric (SRE) to supply up to 1,750 megawatts of electricity from some 70,000 solar dishes to be planted in the Mojave and Sonoran deserts. Other solar developers privately have cast doubt on Stirling’s ability to make good on those contracts, arguing the SunCatcher is just too expensive and complex to compete against solar thermal technologies that rely on mirrors to heat liquids to create steam that drives electricity-generating turbines. But earlier this week, Stirling unveiled the latest generation of the SunCatcher at Sandia National Laboratories in Albuquerque, N.M. The new SunCatcher has shed 5,000 pounds and its Stirling hydrogen engine contains 60% fewer parts than the previous version, according to the company. The SunCatcher also uses a fraction of the water consumed by competing solar thermal technologies being developed by startups like BrightSource Energy and Ausra — no small deal in the desert. Tessera solar farms also can be built in modules, meaning that when a 1.5 megawatt pod of 60 SunCatchers is installed it can immediately begin generating electricity — and cash. California utility PG&E also went modular Thursday when it signed a 92-megawatt deal with New Jersey’s NRG (NRG) for electricity to be generated by a Southern California solar power plant using eSolar’s technology. Google-backed (GOOG) eSolar’s builds its solar power tower plants in 46-megawatt modules. The power plants take up much less land than competing solar thermal technologies, thanks to eSolar’s use of sophisticated software to control small mirrors that are packed close together. NRG earlier this month signed a deal to build a 92-megawatt eSolar-powered solar farm in New Mexico near the Texas border. When Green Wombat sat down for a chat with Ausra founder David Mills back in September 2007, he allowed that it was not unreasonable to expect the Silicon Valley solar startup to soon be building several massive megawatt solar power plants a year. The optimism was not unwarranted. After all, in the space of 12 months Ausra had relocated from Sydney to Palo Alto, raised $40 million from A-list venture capitalists and was about to ink a deal with utility PG&E for a 177-megawatt solar power project. At least any time soon. Ausra last year opened a robotic factory in Las Vegas to make mirror arrays and other components for the many power plant projects it had on the drawing boards. Just three months ago the company flipped the switch on its five-megawatt Kimberlina demonstration power plant outside Bakersfield. But as the credit crunch hit, financing for billion-dollar solar power projects evaporated. Then in October, Congress passed legislation allowing utilities like PG&E (PCG), Southern California Edison (EIX) and San Diego Gas & Electric (SRE) to claim a 30% investment tax credit for solar projects. As the only well-capitalized institutions left standing in the energy game, utilities are stepping forward as investors. PG&E CEO Peter Darbee says he’s prepared to make direct investments in solar power plants – projects the utility needs to comply with a California mandate to obtain 20% of its electricity from renewable sources by 2010 and 33% by 2020. Under pressure to meet those targets, California utilities have signed more than four gigawatts worth of power purchase agreements with solar power plant startups like BrightSource Energy, Solel, Stirling Energy Systems and eSolar. Utilities also have begun signing deals for electricity produced by smaller scale photovoltaic power plants built by companies like First Solar (FSLR) and SunPower (SPWRA). Fishman said Ausra will complete the 177-megawatt Carrizo Energy Solar Farm in San Luis Obispo County on California’s central coast to supply electricity to PG&E. “If Peter Darbee wants to own Carrizo rather than buy the electricity, we’re willing to do it. It makes sense,” he says. Ausra will also will complete a second big solar power plant planned for Arizona. But the company has quietly let drop a Florida project for utility FPL (FPL) and is negotiating to offload lease claims it filed on federal land in Arizona and Nevada for solar power plants during the solar land rush. “Other projects in the pipeline we’ll be selling to utilities or developers for a modest amount of cash with a commitment that those developers must use our technology,” says Fishman. Fishman notes that the cost of licensing a solar power plant can be $5 million to $10 million a year – and in California it’s a multi-year process – so Ausra will realize some immediate savings by morphing into a technology provider. Customers for Ausra’s technology include oil companies that could inject solar-generated steam in oil wells to enhance recovery of thick petroleum as well as food processing plants and other heavy users of steam. Fishman just returned from a trip to the Middle East where he says he held talks in Kuwait, Qatar and Dubai about using Ausra’s technology for oil recovery and desalinization.